I like cooking in the crock pot. Meals are ready when evening comes. It is convenient and simple. 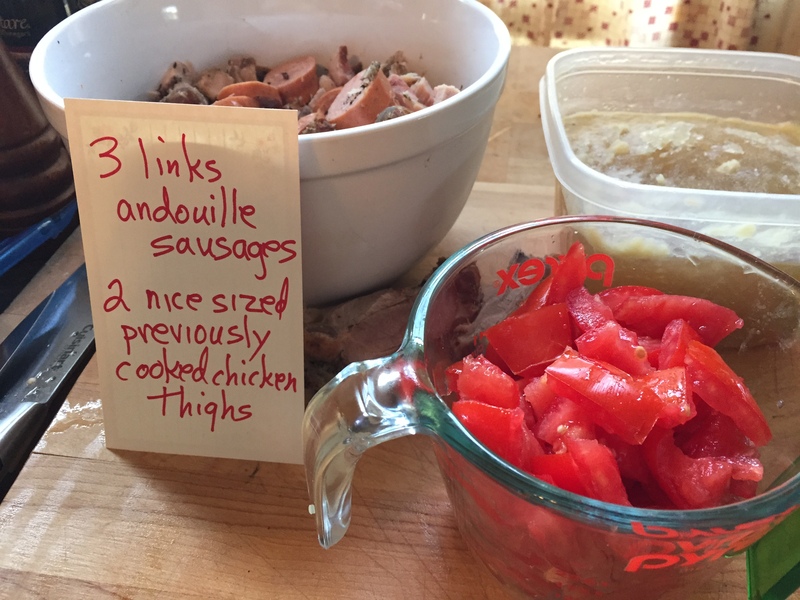 Slow cooking meat this way is a way to turn tougher cuts into tender meals. I usually cook chicken in the crockpot although I have cooked beef. I would like to use it more but to be honest the texture of the meal is similar regardless of what I’ve cooked. It seems to be all “stew-like.” But this does not stop me from preparing meals this way. 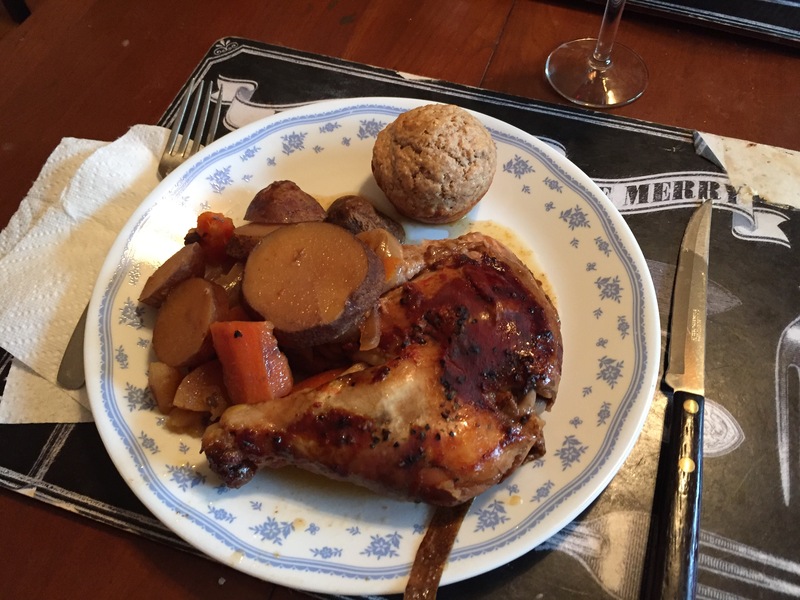 It is rather an assembled meal and not necessarily really a recipe meal. It is convenient. I do not necessarily need the convenience in that I have 1 ½ hours at home alone before my husband arrives home from work. I have 45 minutes to an hour in the morning as well. I REFUSE to feel guilty that I have arranged my work to be so close to home. I do recognize that some may call this a luxury and that not everyone can arrange life like this. But I did and I really enjoy it. Work is work but this change saved my sanity from my previous job! So we had a huge grocery shopping trip this week. And I say “we” because my husband makes it a practice to go shopping with me. Now this is a luxury! Lots of chicken was purchased at my discount grocery store. I have a 10 pound bag of chicken leg quarters. These work nicely in the crockpot. I have every intention of making my own barbeque sauce and barbeque rubs. I have not done so yet. Well, that is not true. I made one sauce and used it over chicken but it would be better over pork. I am not sure that I like it; it is made without ketchup. My plan is to make a simple sauce in the morning before work. This does not happen. I have about ½ cup tomato soup leftover and will use that instead. 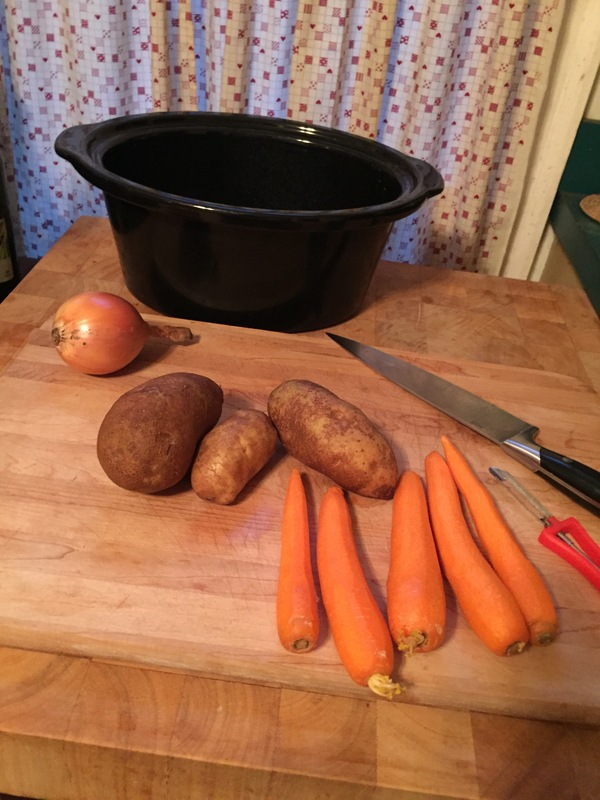 Here is an assembly of ingredients that make a meal: chicken parts, potatoes, carrots, onions, tomato soup, spice rub, liquid smoke. 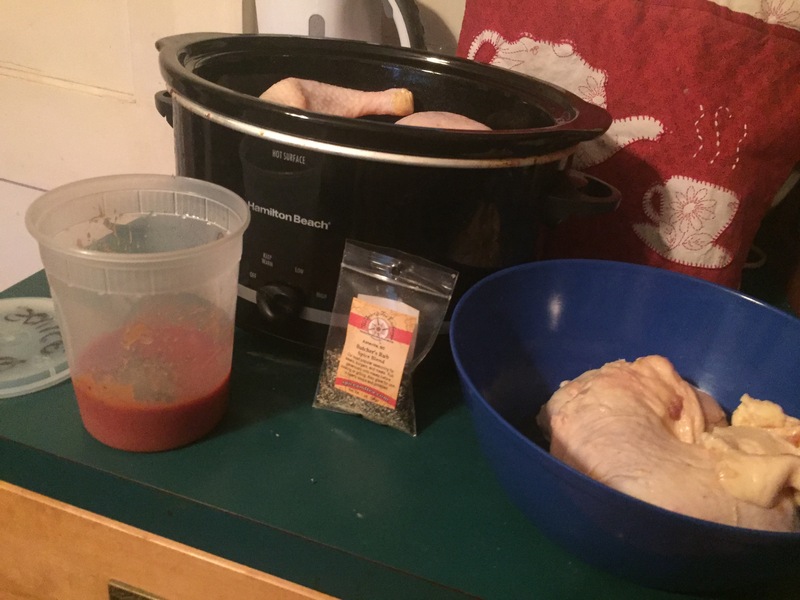 I put all that in the crockpot and cooked it on low for 8 hours then kept it on warm. And then there are muffins. 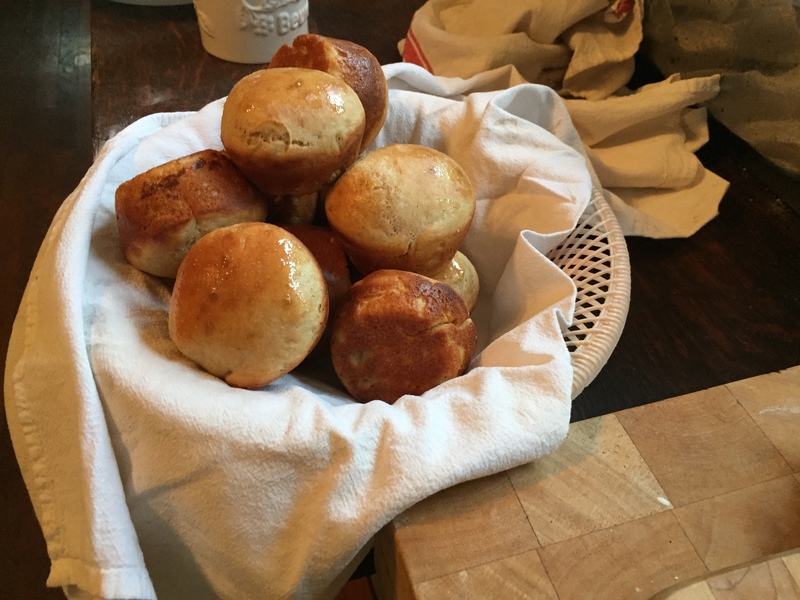 I thought at first that I would make corn muffins but the KAF 200th Anniversary Cookbook had a wheatgerm muffin and I have wheatgerm in my fridge. So that is what I made. Page 76. And then I make pie! Dough from Emily RPCV referenced in previous blog (Savory Pie). And the pumpkin pie from the KAF cookbook. My standard pumpkin pie recipe is from the Betty Crocker cookbook. But I am trying to keep to my goal of baking through this one cookbook. So I had gone to the grocery to buy a few more items that we forgot at the big grocery shopping trip. I come home and bake and bake. I feed my husband and we have a nice dinner. I make the pie after supper and then need to clean up. He says he is not doing dishes until the morning. Well, I did the dishes this morning since they needed to be done. I am sweeping up the kitchen floor and slightly seething, very slightly, not even seething, more like minor brooding trying not to brood, while my husband is trying to get his iPhone to find local pool halls. I have made his favorite pie! I bring this to his attention and he tells me he works hard enough and he is not going to work at home this evening after working hard all day! And he sometimes feels like Cinderella! This is true for both of us. I just wanted a bit of help cleaning up the kitchen. But it is done and we can relax and wait for the pie to cool down so we can have a slice. Pie makes everything right. Happy autumn! These are not biscuits. These are no knead dinner rolls from a Betty Crocker website. Very easy, very quick, and very good hot out of the oven. Do not put these in the microwave the next day as they will become hard as rocks. I did not get to eat a leftover roll with my salad at lunch the next day. Oops! 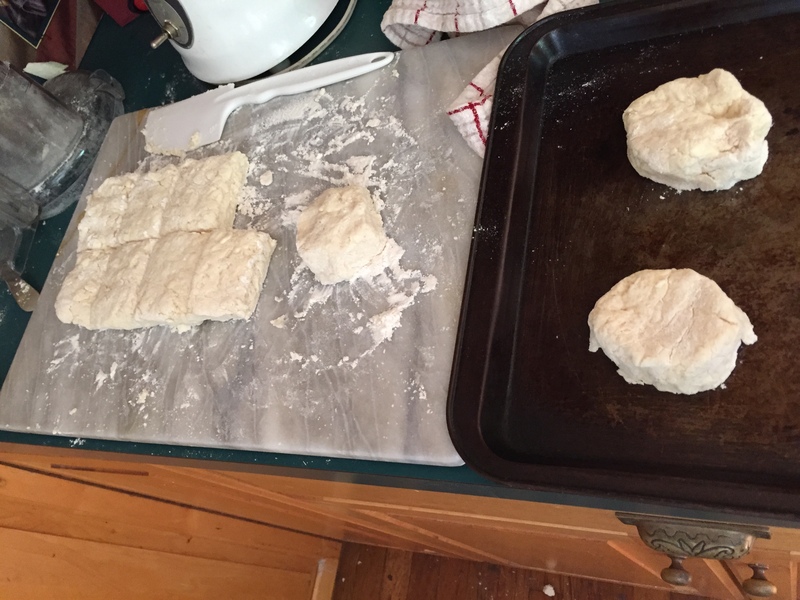 I have not been very successful at making biscuits. They usually end up like hockey pucks. Maybe when first out of the oven and very hot with melted butter they taste okay. I avoid this whole fiasco by baking muffins and popovers instead. 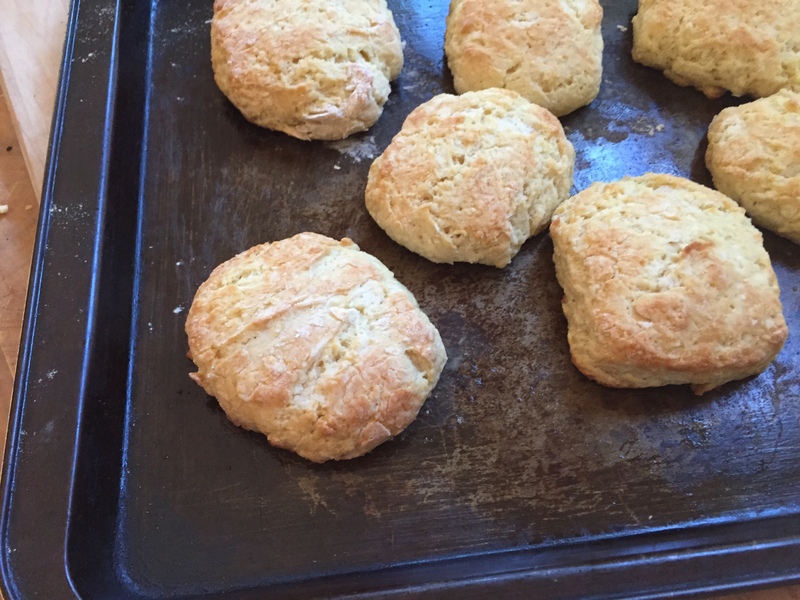 But my quest is to make biscuits that are enjoyable, light and fluffy, and do not have the chemical taste of canned biscuits. 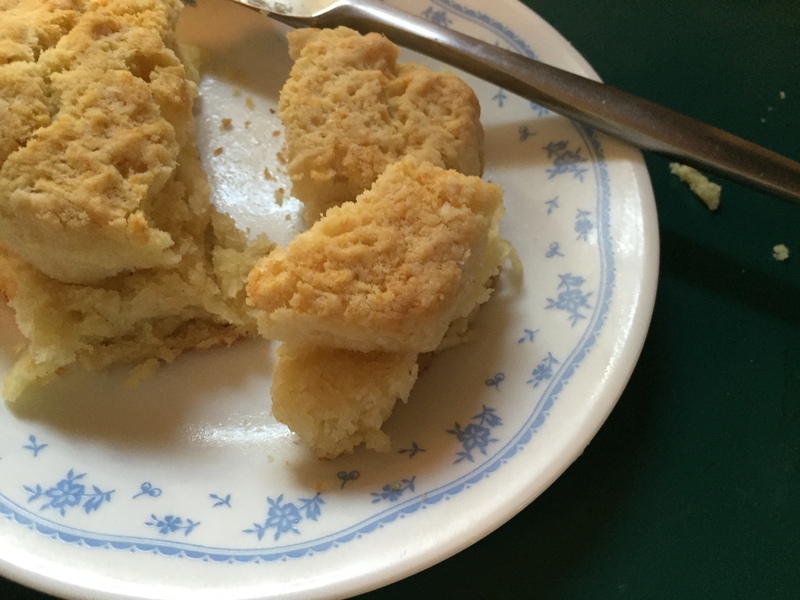 I made one of the recipes from KAF 200th anniversary cookbook, page 69, Bert’s Buttermilk Biscuits using the food processor method. They were good. They had a crisp outside. And they were fine the next morning as well. But they were small and were not fluffy. Now for Grandma’s biscuits. My brother asked me not to share the recipe so I won’t. Let us just say it has a heck of a lot of lard in it. I cannot bring myself to use that amount of lard. No, no way! I am looking up biscuit recipes on the internet and in my many cookbooks and there is nothing that comes close to the amount of lard Grandma used, if my brother’s recollection is accurate. What to do? After a more extensive search I find one, just one, recipe that calls for ½ cup lard AND ½ cup butter. So that is close enough so here goes…but I am still not sure. And those were baked at 500 degrees! Most recipes call for a 400 or 425 degree oven (Fahrenheit). The other issue is that the “best” recipes are using self-rising flour. Grandma did not use self-rising flour. I don’t have self-rising flour. I do know how to make it myself though. Plenty of instructions on the internet. 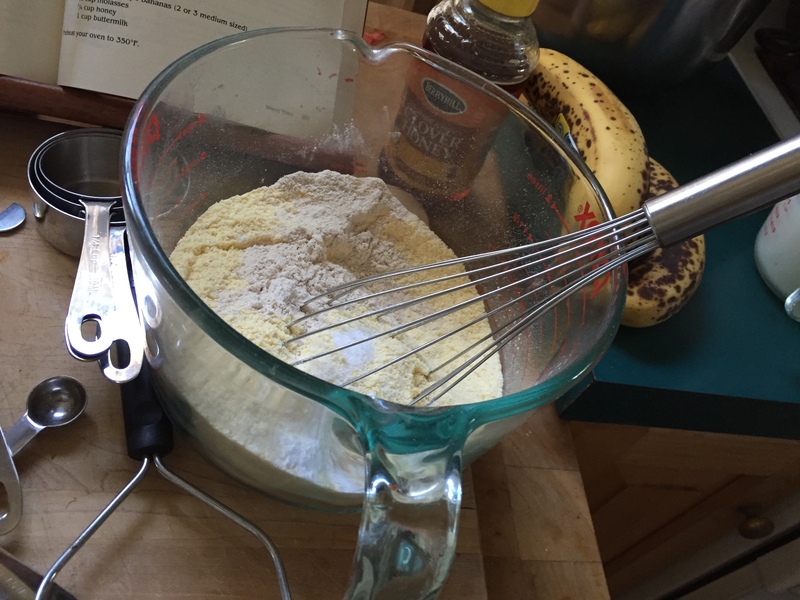 Here’s one: http://www.kingarthurflour.com/tips/homemade-self-rising-flour.html. What to do? Also the best biscuits are made with a sticky dough. I do end up adding a scant ¼ cup more of buttermilk. I bake these in a cast iron skillet. 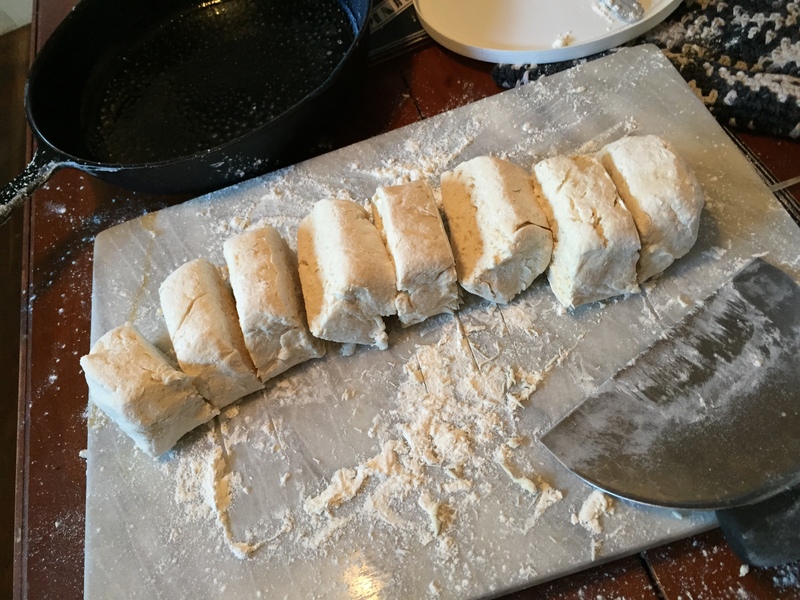 I am careful not to over handle the dough. Crumbly, I may have under baked them so I leave them in the oven a few minutes longer. I miss the butter flavor. I am not sure if I would describe them as light. Maybe next time, using half butter. And half the amount of fat! Hubby likes them but would like them to be less crumbly but likes the crustiness. Could be lighter on the inside. Will be great with jelly. He tasted the butter which was brushed on top. I was disappointed in the rise. I think they taste like Grandma, fat and floury! These are big enough to toast on the griddle the next morning. Be sure to add butter and jam. They still are missing the buttery flavor. The fat and flour fill the mouth. The verdict: we are not biscuit people. I should go back to muffins, rolls, and popovers. However there are more biscuit options to try. Perhaps sour dough biscuits will be next. My mother cut out recipes from the newspaper many years ago that featured a variety of breads to make with sour dough starter. These are yellowing in one of my notebooks but still legible. A friend from church recently gave me a portion of his starter that he made from scratch (without yeast) two years ago. There’s also the possibility of getting some self-rising flour. I’ll have to see what strikes my fancy next! I first had this type of dessert when my son graduated College and we splurged on a dinner at a fancy and expensive steak restaurant in the capitol. We had to valet park the car! I wanted to learn how to make this but never got around to it. I did find a recipe in one of the “light-hearted murder mystery” books that I read from time to time. But I never got around to it then either. 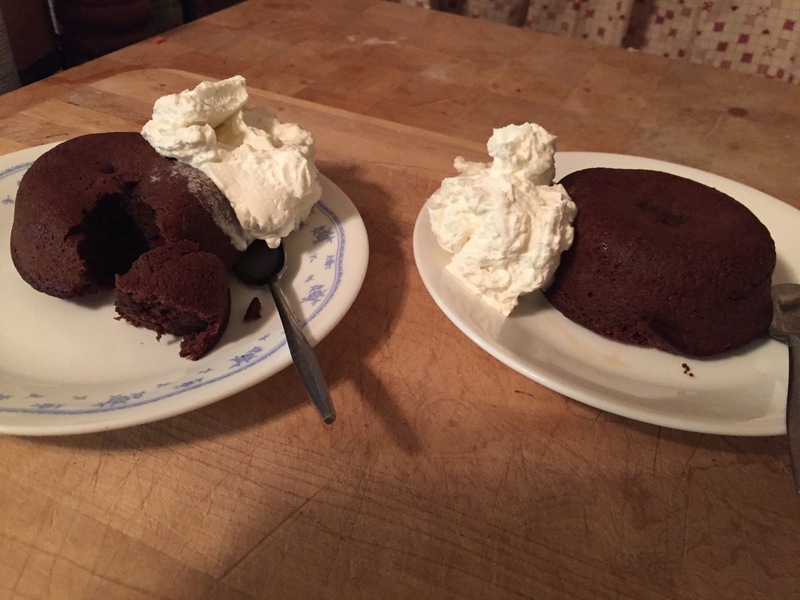 After making this dessert and thinking about it, it is similar to the chocolate pudding cake my mother used to make where the cake bakes on top and forms a pudding underneath. 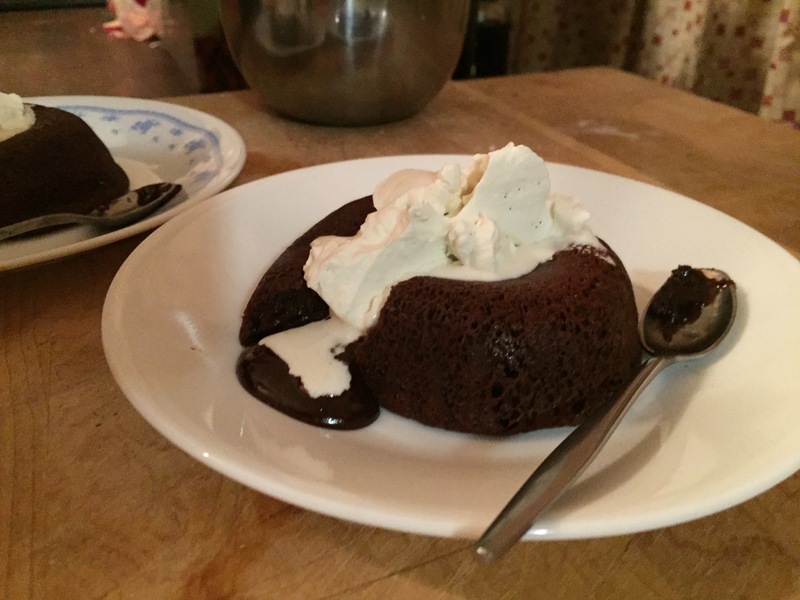 however this chocolate lava cake is so much more elegant. I had to make this recipe twice. The size is perfect for luscious chocolate without so much cake leftover that tempts one to continue to eat. The first batch I made, and I use the word batch loosely, did not have any molten to it. They were very chocolaty and tasty. We whipped some cream to serve with them. 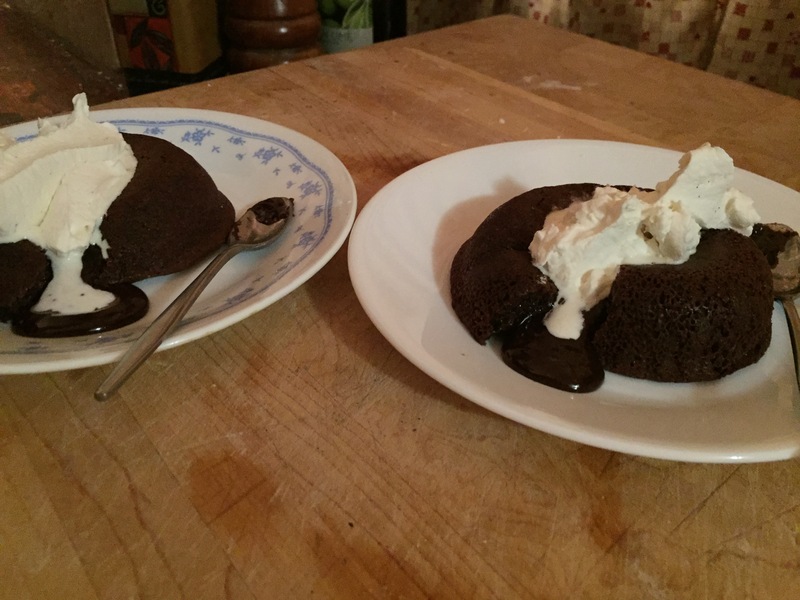 I was trying to figure out what happened that there was no “chocolate lava” oozing from them. They did not look over-baked from the outside. I either left them in the oven too long, left them in the ramekin too long before turning them out on the plate, OR it was the chocolate that I used. I generally have Hershey’s Special Dark chips and not semi-sweet chocolate chips on hand and this is what I used. Could this make a significant difference? I waited a day or two and tried again. I figured this time I would shorten the baking time by 3 minutes. Perhaps my oven runs hot. 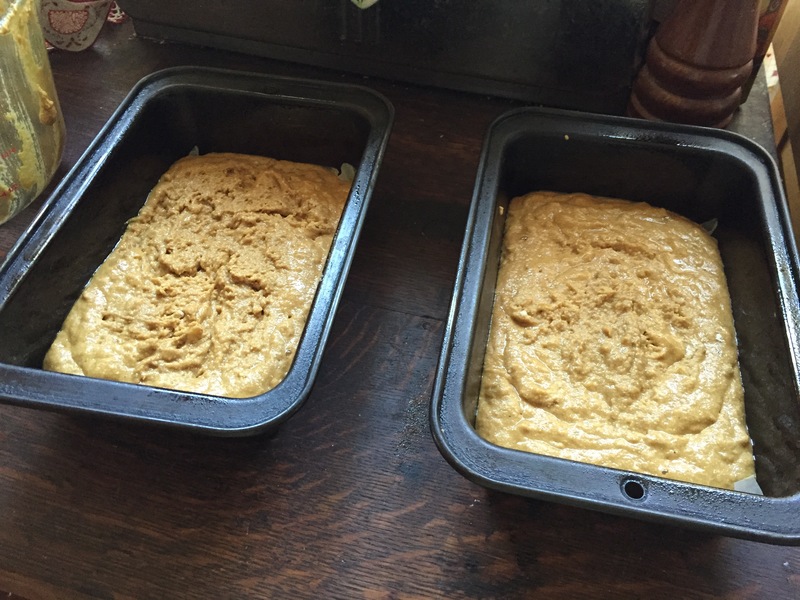 The tops of the cakes did not look quite done; they had a bit of an indentation. But I took them out of the oven 3 minutes sooner than her instructions. I left them in the ramekin for 3 minutes and then turned them out on the plate. And you see the results! So yum, yum, yum! And if I knew how to put a smiley face in this blog I would put it here. 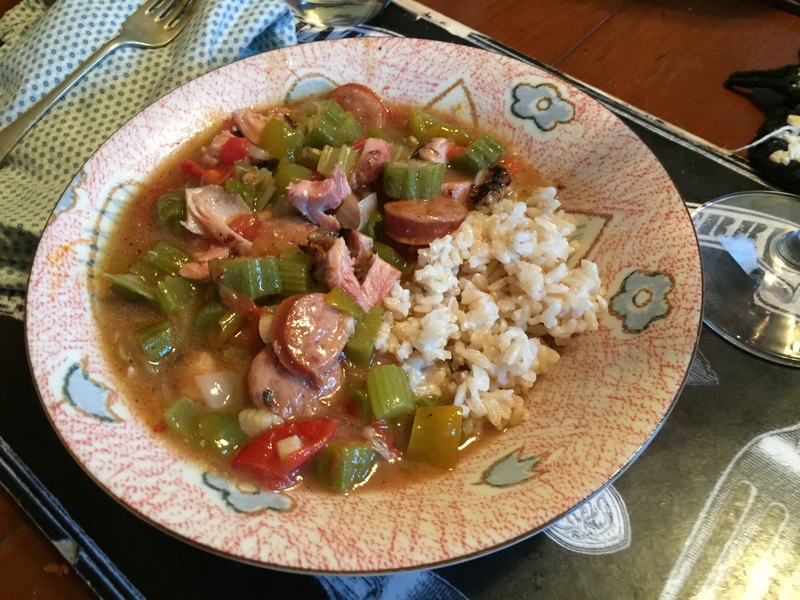 So although I am going to tell you about making gumbo with mostly fresh ingredients and pantry staples I do not usually make this fussy of a meal. And in reading that book it occurred to me that I would like to just make food without fussing over the particular ingredients or methods. But I want to make good food. Food that is satisfying and filling and healthy and nutritious. And on occasion do fussy! This is how my mother fed us. 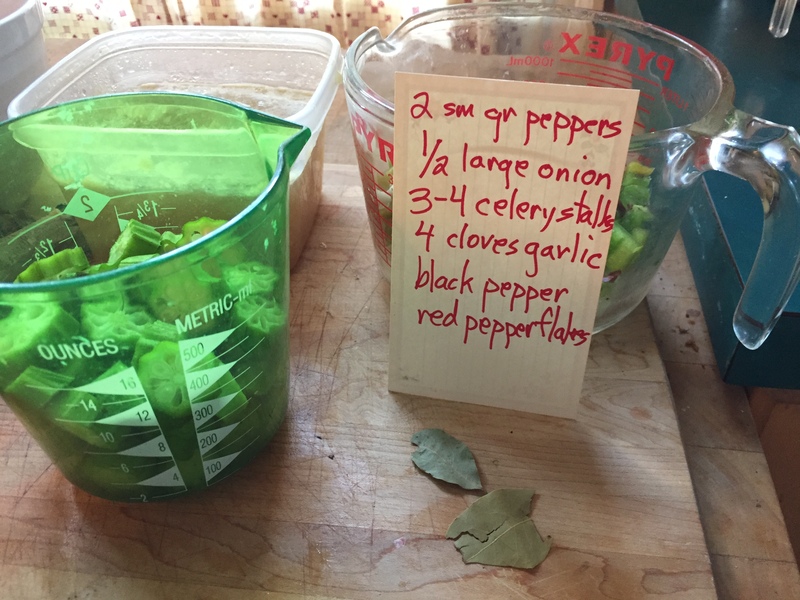 My mom collected recipe clippings all the time. She made few of them. I think she wanted to be more adventurous in cooking and baking but she struggled with obesity and the need to please my father in losing weight. 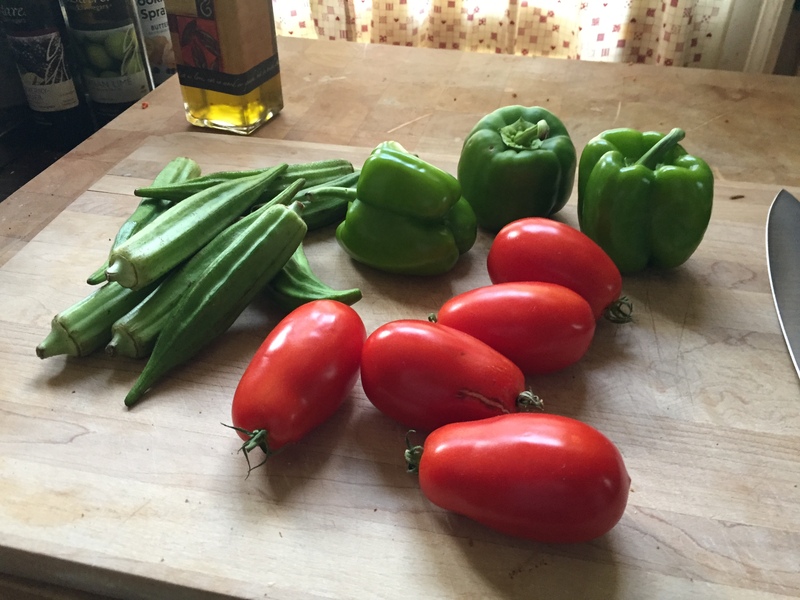 She had to be economical as well so she made do with what were pantry staples and what grew in their garden. I did not get the green thumbs of my mom and dad like my sister and brother, but I did get her “make do” spirit. 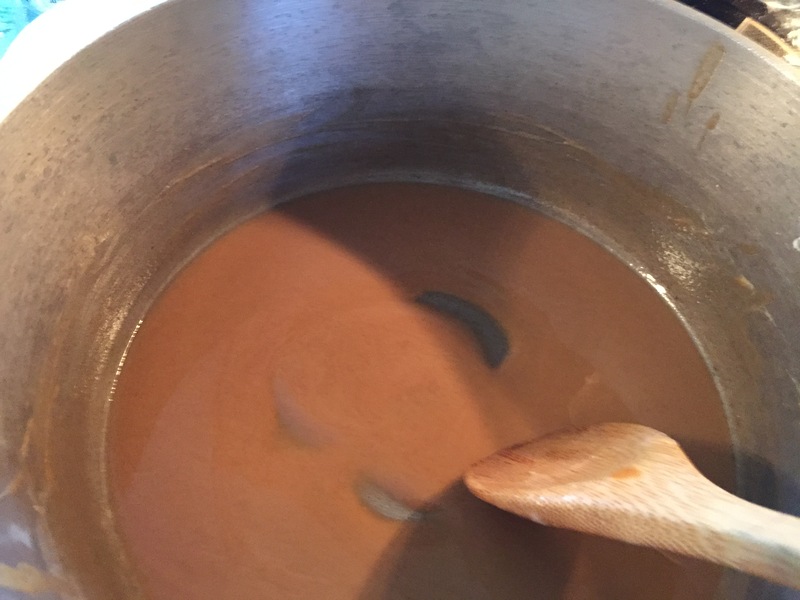 First everything is cut up and then I make the roux. I suppose one does not have to make the roux but it makes it more classic. 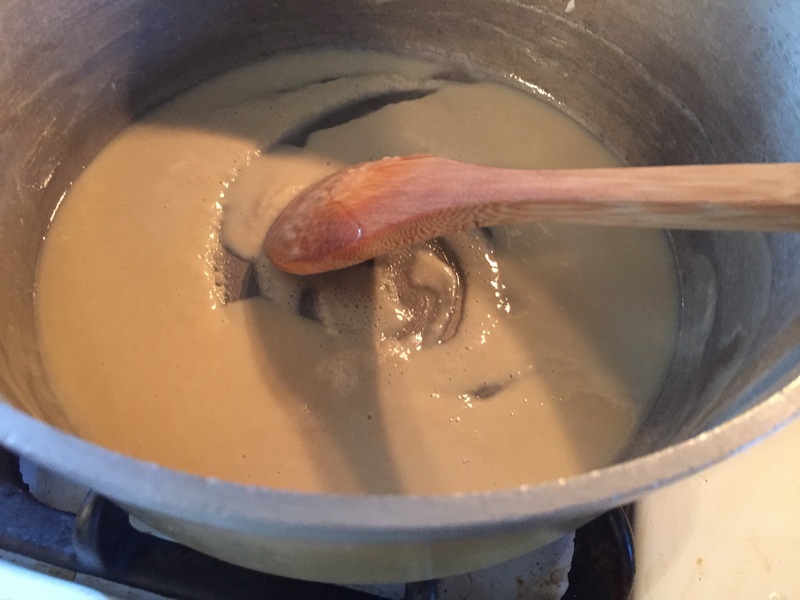 The roux is made with 1/3 cup flour and ¼ cup oil. Why I chose to stand over the stove and stir for this long I am not sure. 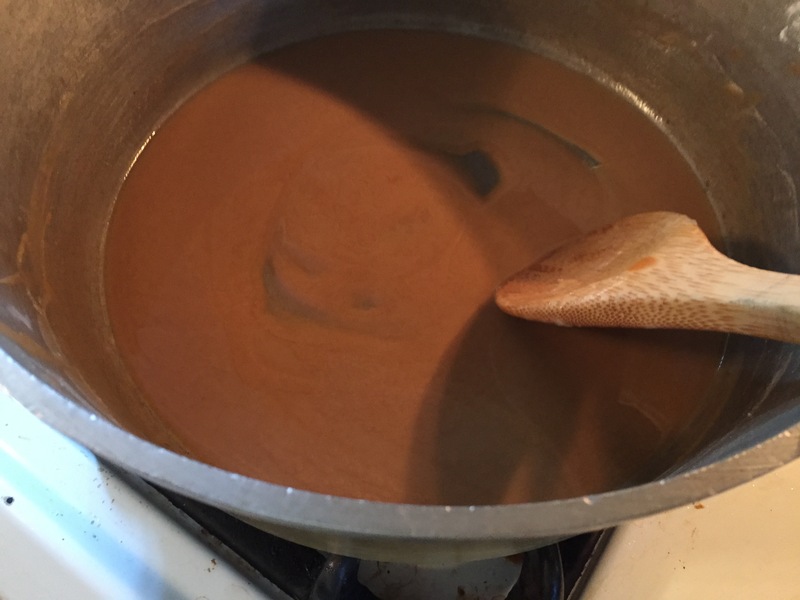 I did not stand and stir for 20 minutes but for about 15 until the roux was a reddish brown in color. Now add the mire poix. It’s not traditional because it lacks carrots but it serves the same purpose. The garlic is in this addition. 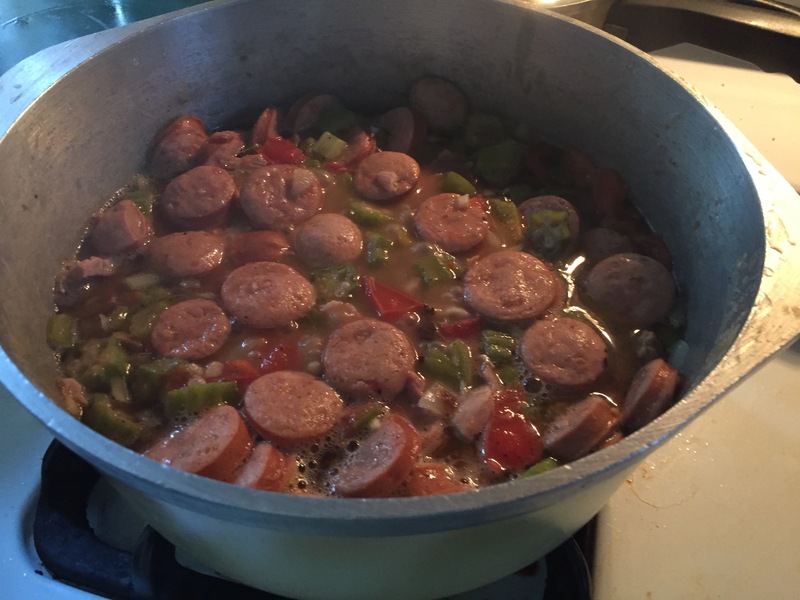 This is cooked for a few minutes , 3 to 5, before adding the broth, and then the meat and okra. This is when I add the tomatoes as well. Bring to a boil and add bay leaves and simmer for 15-20 minutes. Serve over rice. Yummy. And there are leftovers for dinner during the work week. Food is a pleasure. Baking is a pleasure. Life is too short to give up pleasant things. I recently was trying to eat oddly following a “diet book” and it was making me very unhappy. I am reading a book on French home cooking where food and meals are pleasurable and sacred experiences. This is what I would like to experience in my home. It is not about the intricacies of the recipe but the love and care and nurture in the process of making a meal. The weather is cooling down so using the oven will be less oppressive than in the middle of summer. Bread baking season is here. I inventory my pantry and find that I have various flours including gluten free and gluten free baking mix. These are remnants of the “odd” eating plan. No one in the family has to do away with gluten but there it is in my pantry. I now have cinnamon and espresso powder and dark chocolate chips. I have whole wheat, pastry wheat, all-purpose, potato, and white wheat flour. I have about a cup of cornmeal and fancy pure vanilla extract. I plan to make the Artisan Bread in Five Minutes (Jeff Hertzberg and Zoë François book, “Artisan Bread in Five Minutes a Day”) and keep a tub in my fridge. 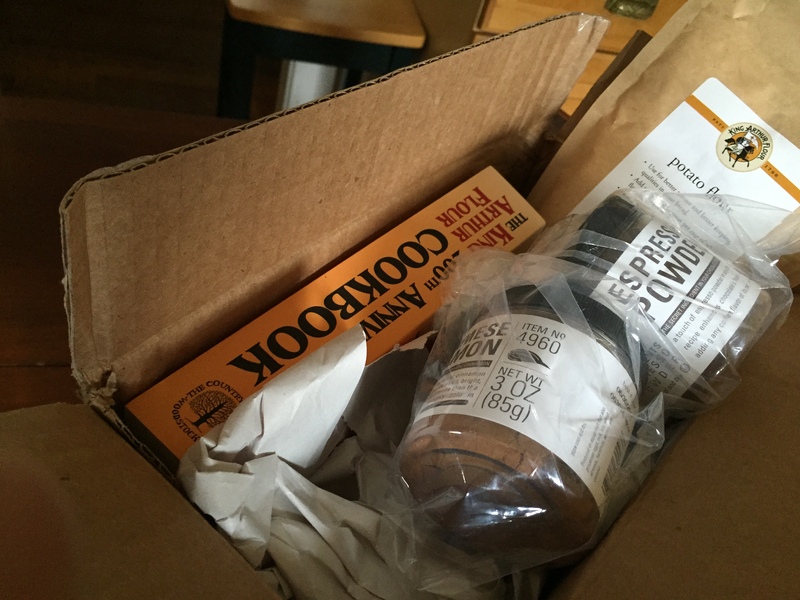 I will also try out some of the recipes from King Arthur Flour. In fact I might as well bake through the King Arthur Flour 200th Anniversary Cookbook from KAF that I just purchased. Granted, it is the 225th anniversary for KAF but I got this book when I used the coupon they offered for entering their contest. It may be 25 years old but it is new to me. I don’t think it is practical to bake every recipe in the book. I will choose a recipe from each category and chapter. My sister had the idea a year or so ago of cooking through one of many cookbooks. She worked on it but I had too many to choose from and never made a selection. Let’s see how far I get with this one. 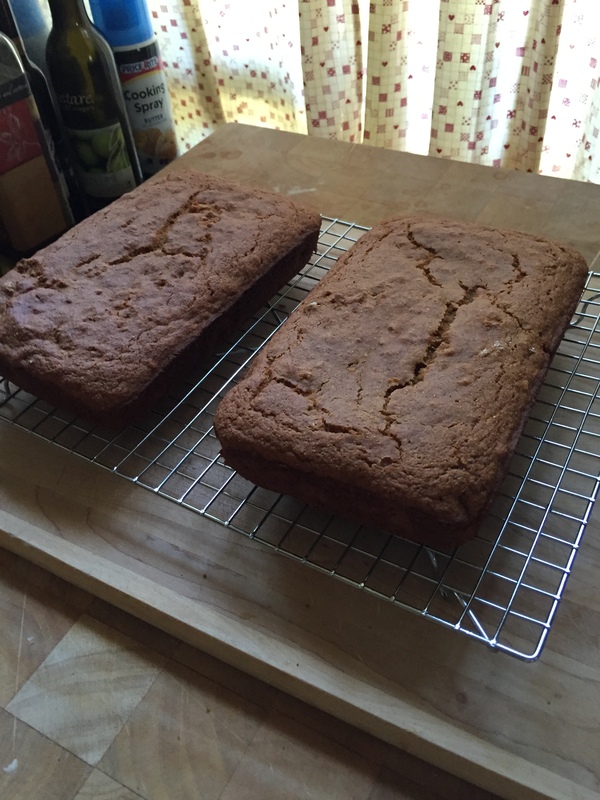 Let’s start with the ripe bananas in my kitchen. Banana bread or muffins sounds fine. Somehow I open up the KAF book to the Whole Wheat section and there is a lovely banana bread recipe using buttermilk, molasses, and whole wheat flour and cornmeal. I had bought an extra jar of molasses because I did not realize it was “extra”; I have a quart of buttermilk in the fridge and realize there is only so much buttermilk ranch dressing one can make. And cornmeal sounds healthy anyway. Mise en place. Gather all ingredients and equipment. 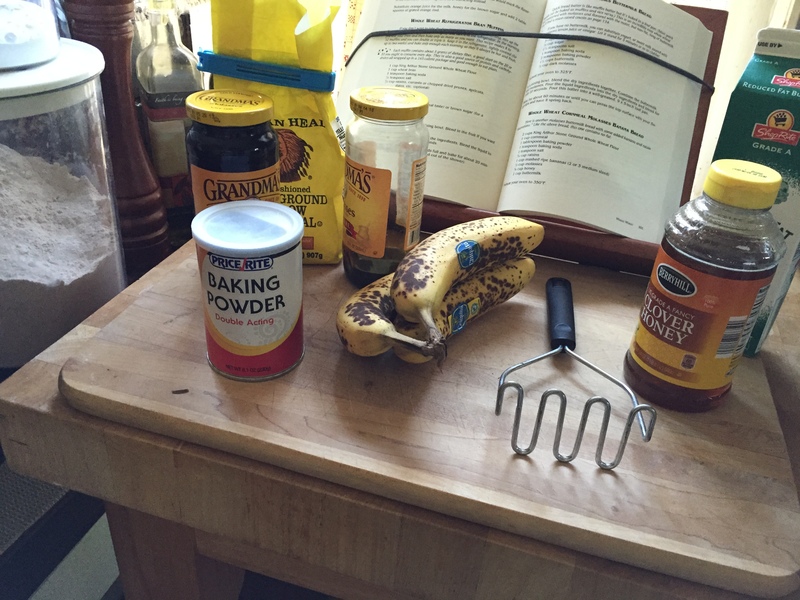 I am baking Whole Wheat Cornmeal Molasses Banana Bread. Baking through a cookbook does not mean having to start from the beginning and go in order. This recipe is on page 501. This is a hearty bread which didn’t rise much at all even though it had both baking soda and baking powder. I will share it with my colleagues at work and see what they think. Hubby liked it with butter and jam. Next it will be on to something chocolate. Do you say chok-lit or chalk-o-lot? Like most American women I can be consumed with the “need” for losing weight. About 15 years ago I was given the news that my cholesterol level was too high. Back then I was a single parent, one child in college and one in high school. I got motivated. One thing that was helpful at that time was that the son in High School was an athlete and also a picky eater, basically grilled meat, macaroni and cheese, and lettuce salad. Since my daughter had gone off to college we no longer ordered pizza and Chinese food alternating weekends. I was free to make a variety of meals for myself. I found then that counting calories was the only way to lose weight along with waking 20 minutes at lunch each day, at least 3-4 days a week. I lost 27 pounds and 87 cholesterol points. Over the years I regained 15 of those pounds and 17 cholesterol points. I love to cook; I love to bake. How does one lose weight? The weight is mostly on my belly so that is the least healthy fat to carry. My husband has the same situation. What to do? Well, last winter a colleague of hubby told him about the Zero Belly diet (David Zinczenko’s Zero Belly Diet ) and raved about it. My husband who has never to my knowledge embraced any diet plan stated that he would be willing to try this. So it is my responsibility to read the book and plan how to put us both on this diet. We found that for the week of learning about the diet, reading the book, and looking at the foods we eat, we both lost a few pounds. We spend a great deal of money on vegan protein powder, vanilla flavor. We did not know it at the time of purchase but this makes the shakes taste like mud. This is just around the time of Lent so we decide to follow this diet for the 6 weeks and end by celebrating with a big Easter feast. I use the menu ideas but not his recipes other than for the Vinaigrette and the Shakes which make up most of the diet along with apple cider vinegar, no dairy, lots of citrus infused water, minimal alcohol, minimal carbohydrates except for whole grains, no refined sugars. So the various testimonials say that the exercise plan is not necessary but half the book describes the exercises. 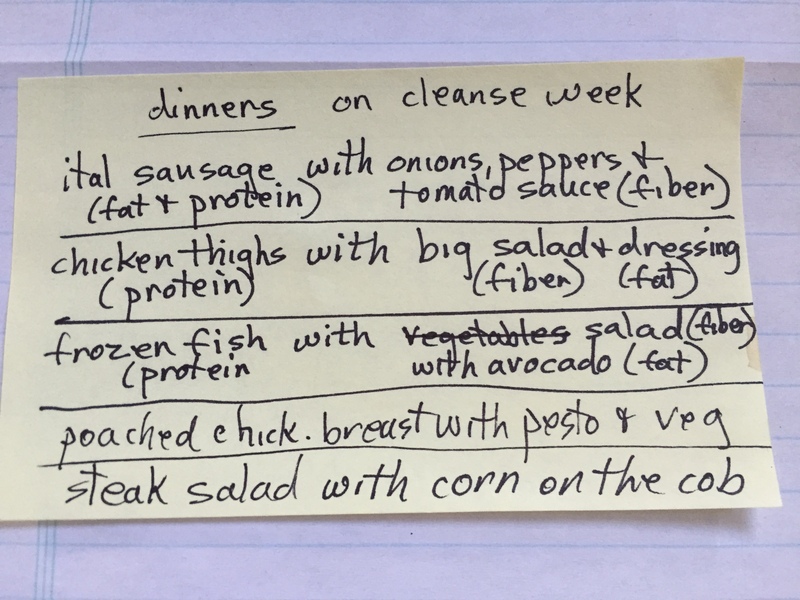 The first half of the book reads like an infomercial but I read the book from cover to cover and we follow the cleanse week exactly but without exercise. I lose 4.5 pounds, hubby loses 6 pounds. ½ inch off my waist; 2 inches off hubby’s. We miss bread and we miss cheese and are not very happy. Our first cheat meal was spaghetti with meatballs, Italian bread, big salad, and red wine. That was a taste of heaven. So I research how to make protein shakes without protein powder because that stuff is processed and the diet is to avoid processed foods. But the alternative is dairy. Slowly over the six weeks we add a bit of dairy and morph it into the “Mediterranean diet”. We are happier. At the end of our six weeks I have lost 10.5 pounds, 3 inches off my waist, and no cholesterol points. Hubby has lost 7.5 pounds, 3 inches off his waist, and unknown cholesterol points. He has since been started on anti-hypertensive medications. I already take those and cholesterol meds. So here it is 5 months later. I have maintained my weight loss give or take 3 pounds and the 3 inches is back on my middle. Hubby is back at starting weight and waist is also back at square one. We are planning a Zero Belly cleanse for the next 6 days and will have a cheat meal next Sunday. I will make a chocolate cake with mint frosting from the DessertforTwo (by Christina Lane) cookbook. Not sure what’s for dinner. I wonder how soon we will add a bit of cheese this time? I have modified the eating plan. The key to Zero Belly is protein, healthy fat, and fiber at each meal. We will use whey protein powder (in our budget), dairy and animal fat in addition to nuts and oils, and have cheat meals every week. I found that the original plan is not a natural way for me to eat or to feed my family. According to the CDC I am 8 ½ pounds into the “overweight” classification. My husband is 25 ½ pounds “overweight”. I suspect that this week will find him with greater weight loss than me because it will be a more drastic calorie reduction. 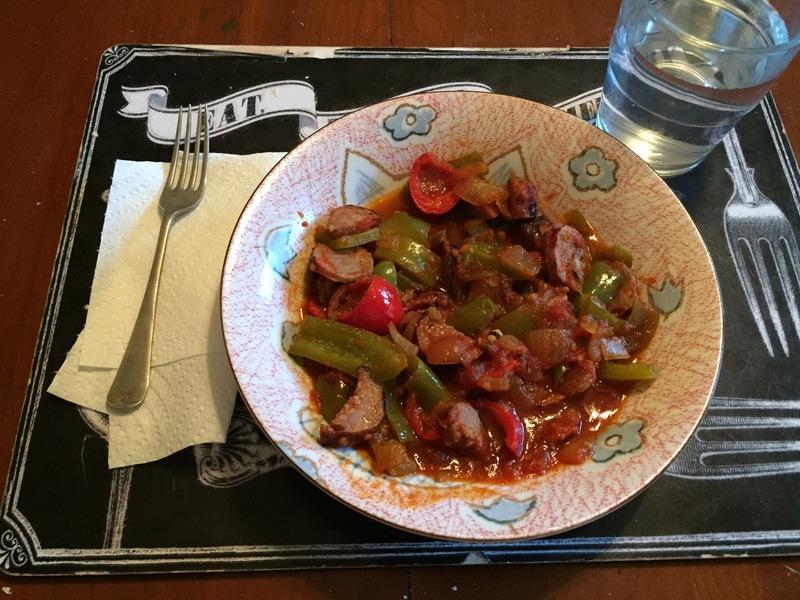 I also walk on a treadmill at the work gym for 25-30 minutes 2-3 days a week and have the opportunity to walk to work which I do not make a regular habit, unfortunately..
Monday: Italian sausages with sauteed peppers and onions in homemade tomato sauce. What’s missing here is pasta noodles and a loaf of crusty bread to sop up the sauce. 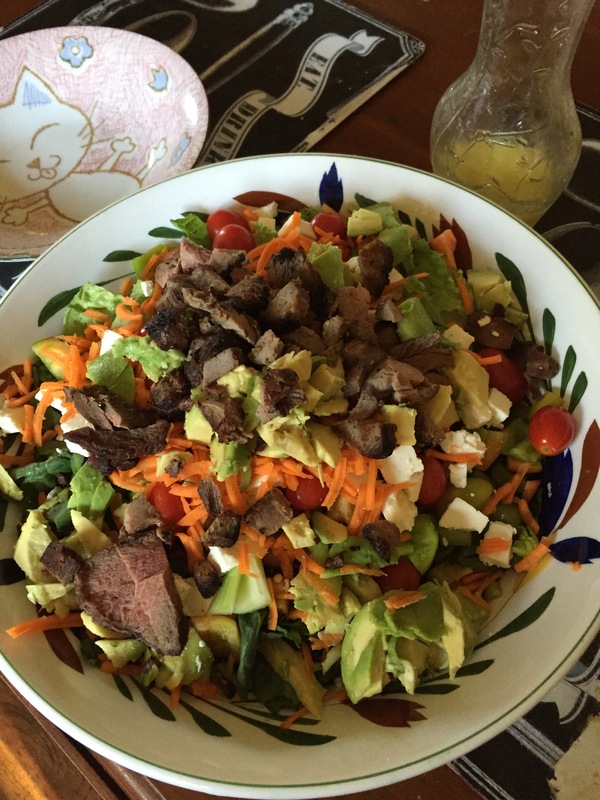 Tuesday: Steak salad with avocado and feta. What’s missing here is a loaf of crusty bread. Wednesday: the plan is for grilled chicken breasts with corn on the cob and leftover salad. On Tuesday we gorge ourselves on watermelon and peanuts after our meal. I’m lying in bed dreaming about baked goods and am haunted by the thought that food is meant to be enjoyed. Sure a protein shake for breakfast is okay but not again for lunch. Yogurt with fruit and honey would taste so good. What’s wrong with a scrambled egg in a wrap with a piece of cheese? 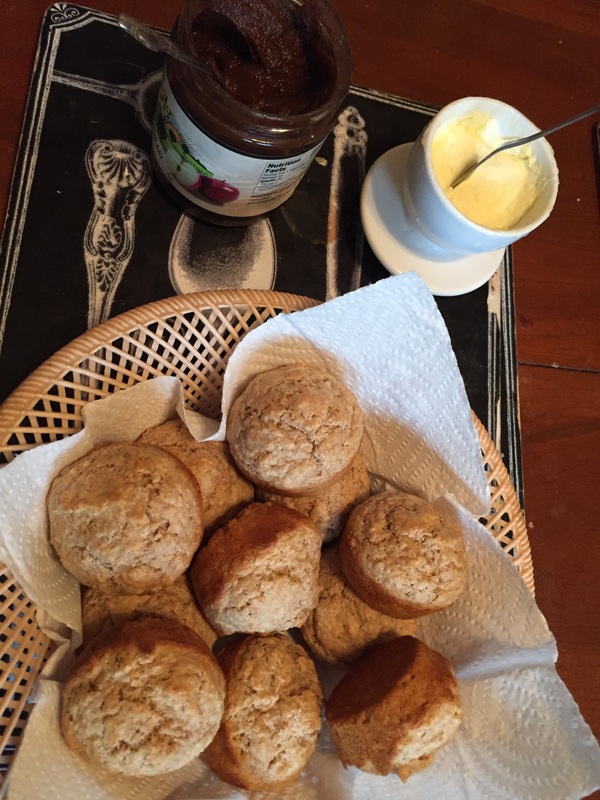 Irish soda bread fresh out of the oven with a bit of butter and jam? Banana muffins made with whole wheat four? The more I feel deprived the more I am likely to over indulge. I quit in the middle of the night and the next morning I feel like a quitter which is not how I see myself. So I will take the yogurt for lunch. It will just be an unassembled shake, and we will continue on the no carbs this week only. These are no carbs in the form of bread, pasta, or grains. We eat fruit daily. But come Saturday all bets are off. Well not really. So for dessert and muffins this weekend they will be from Dessert for Two so as not to over indulge. Now see there, I’m not a quitter! 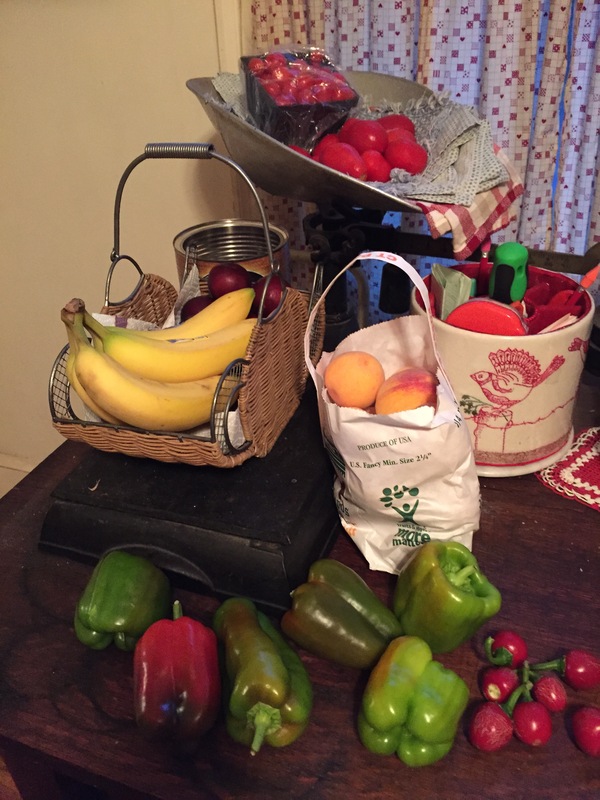 Look at all this healthy produce waiting to be consumed! Confession: On Wednesday both my husband and I took advantage of work provided lunch items including cheeseburger for him, and hotdog (no bun) and an ice cream sandwich for me. Well eating healthy is not about following gimmicky diets even when those diets call themselves a lifestyle change and/or an eating plan. Let us eat, drink, and be merry! 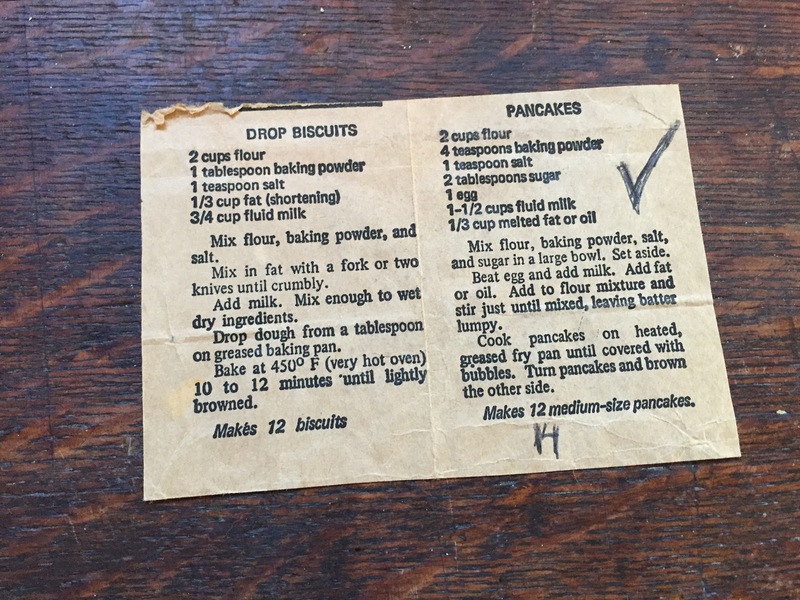 I was looking for my recipe clipping for the very first biscuits and pancakes I made on my own. It is a small piece of brown paper cut from a Commodities flour bag. . Commodities were part of the USDA program to provide supplemental food to the elderly and poor among others. Grandma would cook with lard. There was no shame in frying up chicken or anything else for that matter and mashed potatoes were smothered with butter, or oleomargarine. 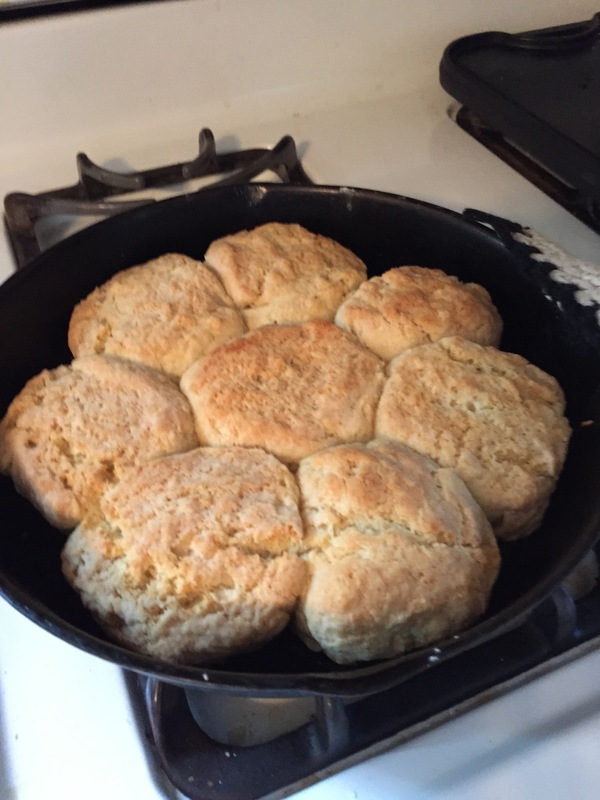 She made the best biscuits ever. I have no idea what recipe she used; I’ll have to ask my sister. She has more knowledge about our family food history than I do. These biscuits were melt-in your-mouth tasty. Eggs would be fried and grease poured over them in the cooking. Grandma and my mom had a bit of weight on them. As they grew older and frailer in health they became thinner but one could always see the remnants of the belly and the round face. I have to watch out for this. I look in the mirror and sometimes see my mother’s face looking back at me. The belly is creeping up on me now too. Lard is making a comeback into the kitchens of America. It is hog fat. It is processed to a degree but does not have to have trans fats. At least the pound I bought recently has 0% trans fats. It is not pure unprocessed “real” food because it has to be preserved in some way. The additives stabilize taste and texture. Shortening has always made a flakier pastry than butter but shortenings are out of favor. Butter seems to have gone out of favor too but hopefully is making a comeback. There are books that tout the healthier nature of butter to the “butter-like substances” filling the dairy shelves, and there are those who claim lard is healthier than butter. 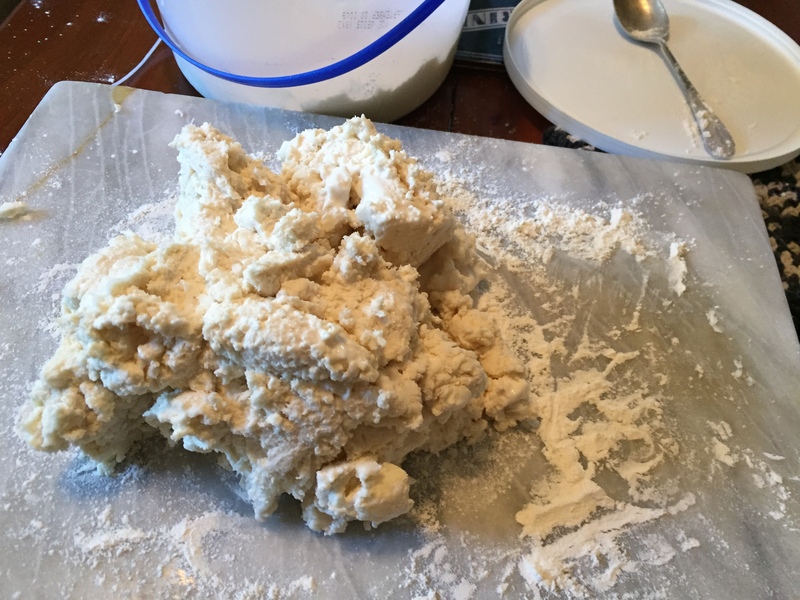 The idea came to me to make pie dough and to use lard. Actually I was watching a TV show on pies across America and one bakery featured used a combination of lard and butter and I liked that idea very much and wanted to try it. 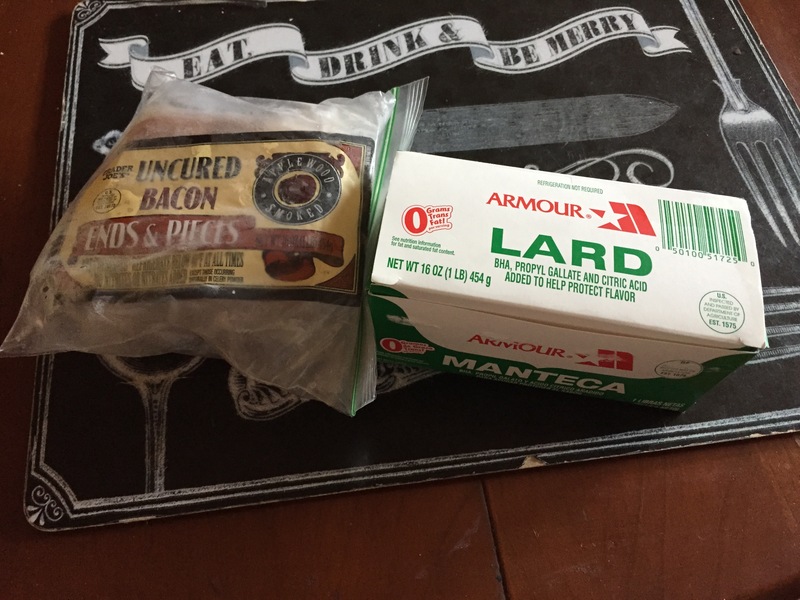 So I find a pound of lard for about the same cost as the pound of butter and bring it home. And what about biscuits? Perhaps Grandma’s were made with lard. Hmmmmmm? Which brings us to the other hog fat that is tasty, tasty, tasty, and which fragrance makes one’s mouth water: Bacon. And not just any bacon. Uncured bacon. Uncured bacon is processed in some fashion but not with the chemical additives so it is safer to eat. On my recent foray into the world of Trader Joe’s my husband and I looked hard and long at the meat. The price of uncured bacon is out of our normal budget but there was this package of ends and pieces. Hey, what the hey. I usually have found myself hacking off an inch or two from the bacon package to flavor dishes and not frying up slices. So this will be fine; I can hack off a chunk to use. I bring the entire frozen package camping. I can hack off a chunk and we can put it with our eggs in the morning. 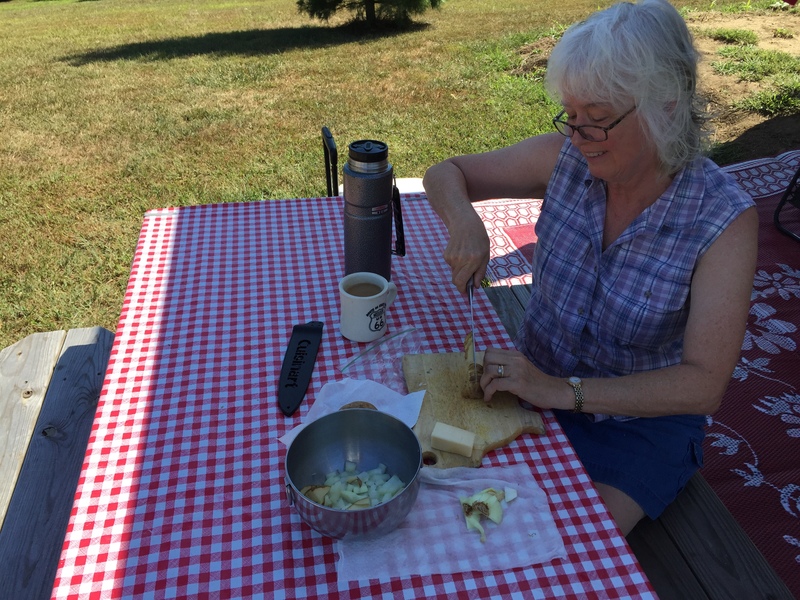 Labor Day weekend we are camping at our new found local private campground and cooking up our eggs in the cast iron skillet on the Coleman road trip grill. 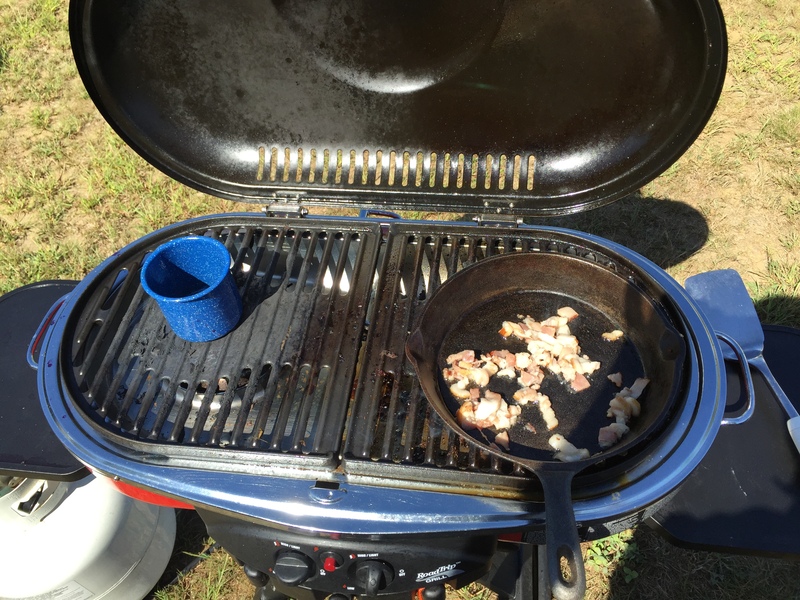 This is my husband’s fabulous new toy since the camping grill and the camp-stove blew up earlier this season! The taste of this uncured bacon was heavenly. Umami: a pleasant savory taste. It fills the mouth. There is a lot of bacon grease that we poured into a tin camping cup and kept. Women used to keep the grease can on the back of the stove to reuse. And then I think: I have two small potatoes that I brought for hash browns and an onion. How about we cook these in the bacon grease? And we do. I cut up two small potatoes into matchsticks. I dice one onion. We fry this up in the cast iron skillet, stirring, and then letting them get nice and crispy. Yum, yum! 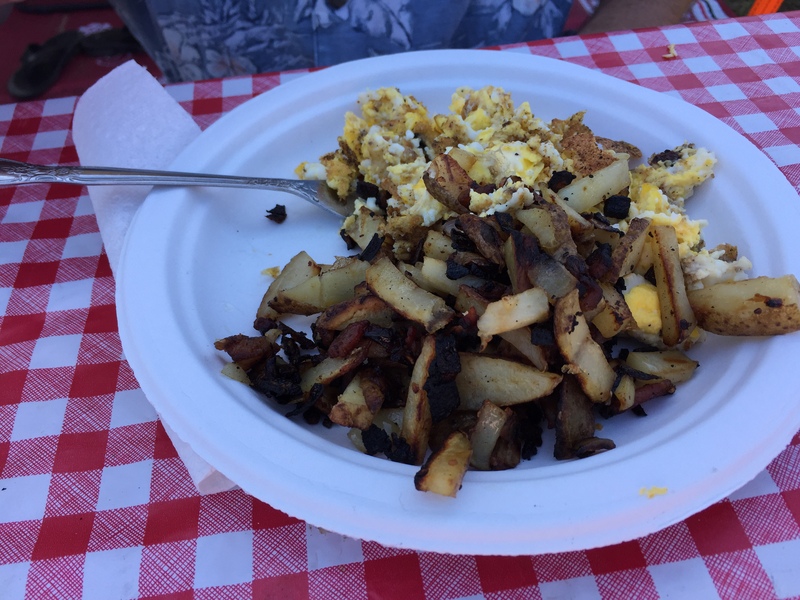 Now there’s a camp breakfast! Granted one cannot cook in fat all the time but every once in awhile, will it hurt?